Boost Ingram is in the Bakugan Special Attack series and it is able to jump before hitting a Gate Card. Its ball form is similar to Skyress. It was the first New Vestroia Special Attack Bakugan ever. In the commercial, it was called Jumper. It is a variation of Ingram. 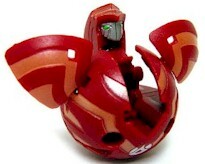 Purchase your Bakugan Boost Ingram from Amazon now!